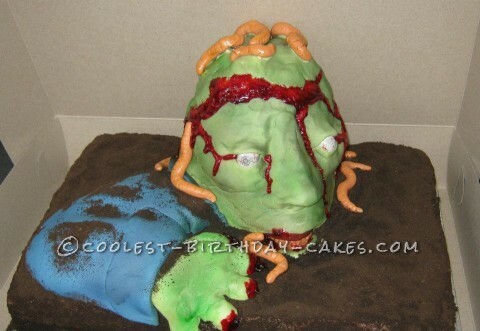 One of my good friends asked me to make a zombie birthday cake for her son’s birthday, my thought was how on earth would I do that! This is what I came up with! I used the largest sheet cake pan Wilton sells and a soccer ball cake to form the cake, carving the head and gluing pieces of scrap cake onto the head to make it look like a face-sort of! Both cakes were chocolate, the bottom was iced then chocolate cookie crumbs sprinkled on top to look like dirt. The arm and head were crumb coated then draped with fondant. I used red piping gel to make the blood and followed a happy accident on the forehead where I had to piece the fondant together to make the tear in the skin. The mealy worms are fondant snakes and the teeth, they are candy teeth and the eyes are eyeball gumballs which I purchased at a local store. It was a hit with all his 20+ yr old friends!